File image of female elk in northern California. Two women have been sent to the hospital after separate elk attacks behind the Mammoth Hot Springs Hotel. CHEYENNE, Wyo. (AP) - For the second time in three days, an elk has attacked somebody in Yellowstone National Park. The National Park Service says a female elk with a calf attacked 53-year-old Penny Allyson Behr, of Cypress, Texas, Tuesday behind the Mammoth Hot Springs Hotel. Yellowstone officials say the elk surprised Behr as she walked between cabins. The elk followed Behr as she backed away and kicked her in the head and body. An ambulance took Behr to a hospital in Livingston, Montana. On Sunday, a female elk with a calf kicked 51-year-old Charlene Triplett, of Las Vegas, in the head and body behind the same hotel. Triplett was in fair condition Tuesday. 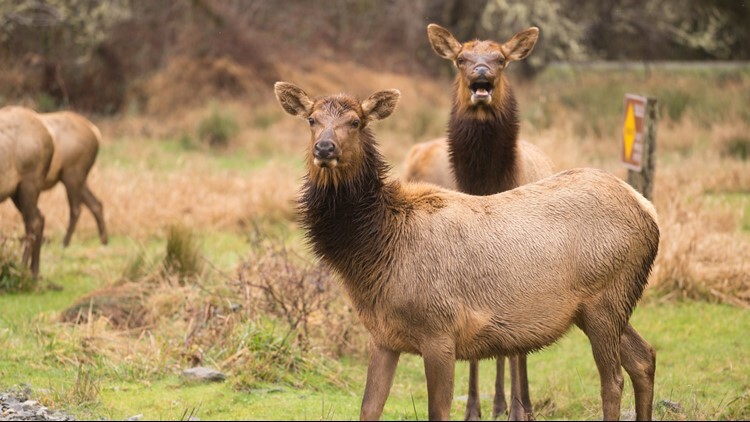 Park officials are unsure if it was the same elk but say elk often aggressively defend their young.